• The itinerary and schedule are subject to change depending on traffic or changes of opening hours at the sights. Full day small group tour of Paris introducing you to the city's most famous sights. Your minibus tour will include free time to explore Montmartre and Notre Dame Cathedral. This will be followed by lunch on the 1st floor of the Eiffel Tower before your day continues with an incredible boat trip along the Seine. Leave your accommodation at 8:15 a.m. to explore Paris's attractions by minibus in a small group. The number of participants is limited to a maximum of eight to allow you to enjoy a personalized excursion with your driver-guide. In the morning, visit the city center by minibus as your driver-guide tells you about the various monuments and neighbourhoods. See the Arc de Triomphe, the Champs Elysées, Concorde, Madeleine, the Opera House, the Latin Quarter, the Orsay Museum and the Alexandre III Bridge. Two free-time stops are scheduled as part of your tour: around half an hour at Montmartre (the artistic Place du Tertre Square and the Sacré Coeur Basilica) and 20 minutes at Notre Dame Cathedral. At lunchtime, your priority access ticket will allow you to skip the line and go straight up to the 1st floor of the Eiffel Tower for lunch in an exceptional setting, 187 feet off the ground with panoramic views over Paris. In the "58 Tour Eiffel" restaurant, which feels just like a typical Parisian brasserie, you can sample fresh, seasonal produce with our three-course menu. In the afternoon, step aboard at the foot of the Eiffel Tower for a one-hour audio guided boat trip along the Seine River with music. 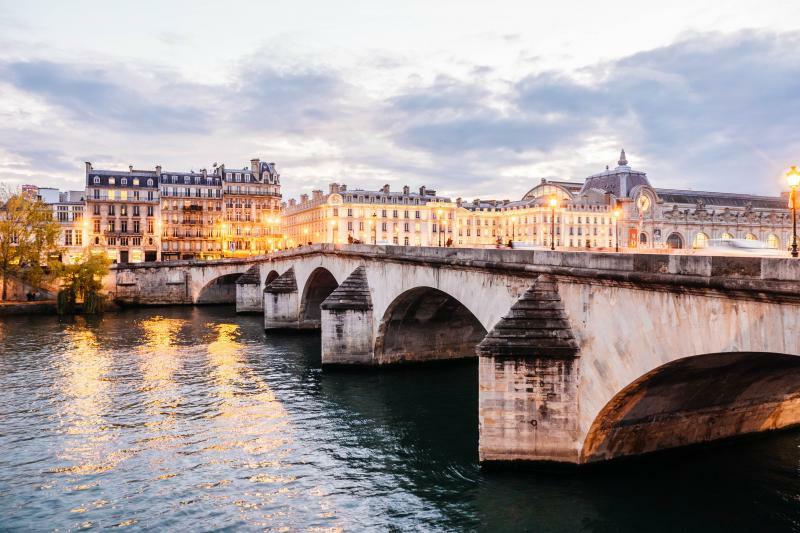 Admire the splendid architecture of the heart of the city's most prestigious monuments that line the Seine: the Louvre Museum, Notre Dame Cathedral, the Orsay Museum, the Conciergerie, etc. Relax on the fully-glassed boat with terrace and glide along as you experience Paris from the river. Once your tour has finished, your driver-guide will take you back to your accommodation in Paris.